Miami Valley high school students are invited to make a film in 48 hours with Dayton’s best filmmakers. The Muse Machine is partnering with FilmDayton to present the wildly fun and educational 48 Hour Film Boot Camp. For one action-packed weekend in January, area high school students will work with award-winning Dayton-based filmmakers to learn how to write and direct their own short film. As part of this process, students will also format, storyboard, edit, film, score, and rough cut their films. Finished films will be presented at the end of the Boot Camp weekend on the “big screen” at Wright State University’s esteemed film production facilities. Students who are interested in filmmaking, film school, acting, or just want to get a taste of filmmaking, are encouraged to participate. Registrations will be accepted through December 31, 2009. Registration is $90 for Muse Members. Equipment, breakfast, and lunch are included. Email Eva Buttacavoli, eva@musemachine.com, to register and/or become an $11-a-year Muse Member. Include name, email address, home address, phone number, school, and grade level. Wright State graduate Filmmakers/Instructors Marisha Mukerjee and Rocky Smith will lead sessions that encompass filmmaking basics, from writing a script to shooting to editing on simple, widely available software programs, and will culminate in the creation of a short film. Marisha Mukerjee lives and works in Chicago and Dayton; co-produced the feature film The Grind; directed and/or produced numerous short films and theatrical productions for a wide range of venues; and is co-founder of Relief Productions Theater Group and Madrina Films. Rocky Smith lives and works in Springboro and was the co-producer and co-director of Toughman, which premiered at Wright State’s 2009 Big Lens Film Festival, and was awarded “Best Ohio Short” at the 2009 Oxford International Film Festival. Smith has also worked as a key grip, sound department, stunts, and assistant editor on four award-winning short films for the 48 Hour Film Project. Become a Fan of Muse Machine on Facebook! community and working to create a richer environment here for future moviemaking. Become a Fan on FilmDayton on Facebook! The Ohio Film Office launched the Ohio Film Music Video Challenge on February 18th at http://Contest.DiscoverOhioFilm.com. partner with a musical act, create a concept, shoot the video, edit the video, and post it to be judged (rated) on the official YouTube contest page at http://www.youtube.com/group/DiscoverOhioFilm. YouTube site no later than March 11, 2009. ● Only works that meet the deadline will be officially part of the competition. the 10 top videos by voting on (rating) them at http://www.youtube.com/group/DiscoverOhioFilm. ● Professionals in both music & film/video industries will judge the top 10 video from Marc 19 –25, 2009.
team leader from the top 10 selected videos must be present to be eligible to win the challenge. Gov says film incentives coming to Ohio! In today’s State of the State address, Gov. Strickland made a surprise announcement, that was music to the ears of FilmDayton: “We will create a Film Tax Credit designed to spur the growth of the film industry, bringing new jobs and creative energy to Ohio”. HB196 that would have created film tax incentive passed the Ohio House & Senate with resounding support, but Governor Strickland vetoed it earlier this month. FilmDayton members had testified on behalf of this bill and are pleased to know that Strickland has obviously been swayed by the strong support and knowledge that such incentives will bring film work to Ohio. To read the entire text of today’s address, click here. 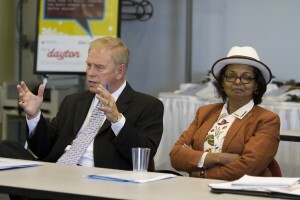 Jan 28, 2009 | Categories: Film Dayton | Tags: Film Dayton, film tax credit, Strickland | Comments Off on Gov says film incentives coming to Ohio!